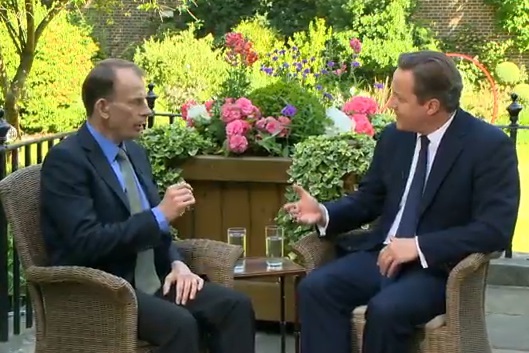 The BBC recently broadcast an interview with David Cameron (The Andrew Marr Show, 21st July 2013). A portion of the interview concerned Syria (full transcript below). Although this was an opportunity to question some of the statements being made by the Prime Minister, the interviewer (Andrew Marr) allowed much to go unchallenged. There have been allegations by Western governments of this, but no proof has been presented. Equally there have been claims of chemical weapons use by the opposition, but this was allowed to go unmentioned. Except that there is no evidence that any part of the opposition represents the Syrian people, and what evidence there is shows that the majority of Syrian people want, for now at least, President Assad to stay in power. This is an incredible allegation for David Cameron to make, and yet he offers no evidence, and is not asked on what grounds he makes the allegation. The statement is simply allowed to pass as fact. None of this would really matter if it weren’t for the fact that by supporting the ‘rebels’ in Syria, the UK and other governments are fuelling a war that has killed tens of thousands of people, and threatens to expand into a wider conflict across the region killing who knows how many more? We often hear the term “state TV” applied to foreign TV stations, with the implication that they are biased mouthpieces of their governments. And many people laugh at the notion that the BBC is comparable. But how is this ‘interview’ in the gardens of Downing Street that provides a platform for the Prime Minister of the UK to make unchallenged allegations, any different from the “state TV” of other countries? You can watch the interview on BBC iPlayer (starts at 42m 29s), but only for the next few days. It is also on YouTube (although no guarantees if it will stay). Andrew Marr: Let’s turn to the biggest foreign crisis which you face at the moment, which is Syria. Sort of six months ago you were warning the Assad regime was on it’s last legs and was beginning to be kind of flirting with the idea of supplying arms to the rebels. Now the Assad regime is fighting back, it seems to be stronger and stronger, we read that Al-Qaeda has enclaves inside Syria which they’re now ruling, and General Sir David Richards has warned about the danger of arms that we put into Syria ending up in terrorist hands, it looks a totally different picture. DC: I think it is important though, it’s no good complaining about the rebels if you’re not going to try and help those that want a free, democratic, pluralistic Syria and that’s why we’re helping with non-military equipment, we’re helping with technical assistance and training, we’re working with other like-minded countries including those in the region to help those who want a democratic Syria. AM: Bluntly, this is a war in which the bad guys are winning and the good guys, from your perspective, are losing, and there’s no sign of that changing. DC: I think he may be stronger than he was a few months ago, but I’d still describe the situation as a stalemate, and yes you do have problems with part of the opposition that is extreme that we should have nothing to do with. But that’s not a reason for just pulling up the drawbridge, putting our head in the sand, to mix my metaphors, and doing nothing. What we should be doing is working with international partners to help the millions of Syrians who want to have a free, democratic Syria, who want to see that country have some chance of success. DC: It’s a total urban myth, I mean Samantha went to a refugee camp in Lebanon because she wanted to see for herself, she works – does some work – for Save the Children and wanted to see this for herself and she was very moved by what she saw because you hear from people, and I’ve done this, you hear from people who have fleeing an appalling regime that is murdering their husbands, wives, children, wrecking their communities and also the point that she’s made and that I’ve made, is there also, the regime is fermenting the extremists, so they can then say to the rest of the world “Look! The alternative to me, Assad, is these appalling extremists” and they don’t want us to see that in the middle of Syria are millions of people who want what we have which is the chance of democracy, prosperity and success. AM: When I spoke to David Milliband last week, he said pretty bluntly, you know, we’ve missed the boat on this, it’s too late, it’s too late to put in arms and this is a tragic situation but we can’t militarily intervene in any way. AM: And won’t? And won’t? DC: Well we’ve made no decision about that, but what we can do is work with partners to strengthen those parts of the Syrian opposition that really do represent the Syrian people. But, I never really, sorry, answered the question about my wife (laughing) she does not influence my policy on this. I’ve been very passionate about this for a long time, but I would accept that we’re on a depressing trajectory and we need to change. ← The kinetic weapon option is on the table..